How a Mao-era Chinese agricultural conglomerate came to dominate the African tomato market. 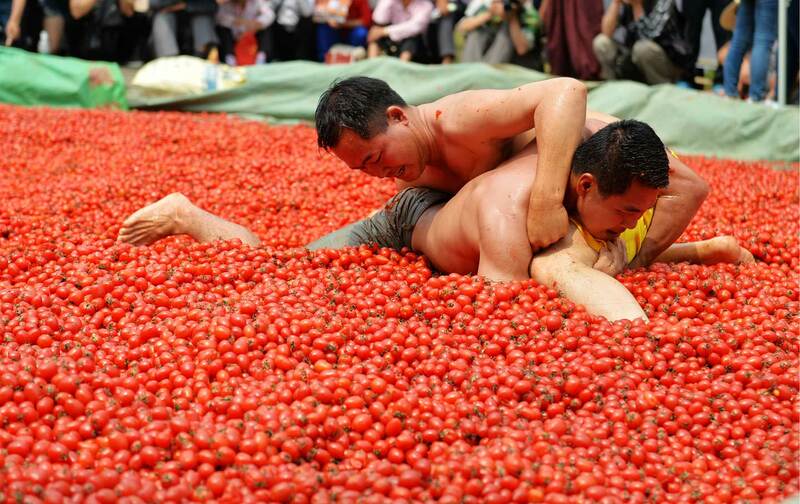 A hundred workers were picking tomatoes in a field near Wusu, a town in northern Xinjiang Province, China, half way between the provincial capital, Ürümqi, and the border with Kazakhstan. Most were migrants from Sichuan Province, with a few Uyghurs. A teenage girl raised her cleaver above her head and cut off a leafy stem laden with ripe fruit. Another worker picked up the stem and shook it, and the tomatoes fell to the ground with a thud; gradually, the field was covered with red and green stripes. Men and women crouched down to fill big plasticized canvas sacks. They were earning 2.2 renminbi for each 25-kilogram sack, just over 1 US cent per kilo. “Me and my wife can sometimes fill 170 sacks in a day,” said one worker. That comes out at around $28 each, 10 times more than they earned in the early 2000s. But now they compete with machines imported from Italy. Translated by Charles Goulden. This essay continues our exclusive collaboration with Le Monde Diplomatique, monthly publishing jointly commissioned and shared articles, both in print and online. To subscribe to LMD, go to mondediplo.com/subscribe. From a corner of the field, Li Songmin watched his tomatoes being harvested. Li rents the field and didn’t know the pickers, who were all recruited through an agent. That evening, a truck would deliver the tomatoes to a factory run by Cofco Tunhe; that was all Li knew. Cofco Tunhe supplies him with high-yield Heinz varieties, which he must grow according to precise specifications, and guarantees to buy the crop at a pre-agreed price. The China National Cereals, Oils, and Foodstuffs Corporation (Cofco) is China’s largest tomato processor and a Fortune Global 500 corporation. It’s a conglomerate that brings together entities established during the Mao era, when it was the only company authorized to import and export agricultural products. Its subsidiary Tunhe, which specializes in sugar and industrial tomatoes, has 15 tomato processing plants, 11 in Xinjiang alone, producing drums of paste that it sells to agrifood giants such as Kraft Heinz, Unilever, Nestlé, Kagome, Del Monte, PepsiCo, and McCormick, the world leader in seasonings and spices. It’s not hard to find the entrance to one of these factories: just follow the convoy of trucks loaded with red fruit. The Cofco plant in Changji turns out 5,200 tons of paste a day. “We only produce drums for export. They are shipped to Europe, the US, Africa, and all over Asia,” says Wang Bo, one of the plant’s directors. Workers on walkways above the loading dock train powerful water jets on the trailers, and wash the fruit down chutes into a “river” that rinses them, and carries them to be peeled, de-pipped, crushed, and heated. At the end, workers line steel drums with sterile bags, connect them to an Italian-made filling robot, press a button and check a monitor: In a few seconds, the 220-liter bags are full of triple concentrate. “The margins in tomato processing are small,” said Yu Tianchi, head of tomato operations at Cofco Tunhe. “Heinz buys our paste so it can focus on areas of processing and production where the margins are bigger.” HGVs carry the paste to a rail yard, where its long journey begins. Its first stop is the canneries of Tianjin, nearly 1,900 miles away at the other end of China. When Ma Zhenyong, director of the Jintudi cannery, pushed open a heavy door, a wave of heat and noise washed over us. They don’t process tomatoes here but reheat paste from Xinjiang and can it. Under yellowish neon strip lights, the machinery discharges a torrent of full cans, steaming hot. The main production line fills 70-gallon cans, the smallest size; an auxiliary line fills 400-gallon cans. The plant operates on three eight-hour shifts, and turns out some 2,000 container-loads a year. Workers are paid the equivalent of $550 a month for a 56-hour week, according to Ma. The labels claim that cans produced at this plant contain only tomatoes and salt. This is misleading. In the area where the contents of the big drums are pumped out is a room with equipment used to mix in additives such as soy fiber, starch, and dextrose. Ma would not allow me to go in, but I sneaked a look. A worker stood on a platform next to a mixing machine, pouring bags of white powder into the tomato paste. Nearby, four people in gloves and masks handled drums filled with an opaque orange mixture—food coloring. This doesn’t appear on the labels either. Ma had told me, “We have all the necessary certification for a food-manufacturing company, including ISO 22000, which is compulsory for exporters.” In the dispatch area, containers were filled with red cartons, and sealed with a numbered tag for shipment to Africa. Hundreds of farmers in Techiman, in the Brong Ahafo region of Ghana, grow tomatoes. Tomatoes were introduced to Africa during the colonial era, and are now part of many popular Ghanaian dishes, accounting for 38 percent of household spending on vegetables. Ghana has 90,000 small growers, and official figures put production in 2014 at 366,772 tons of fresh tomatoes. They don’t sell well on the markets in Techiman, where shoppers scramble for cans of cheap concentrate made in China. Africa’s imports of tomato paste have grown steadily over the last 20 years. According to the UN Food and Agriculture Organization, Ghana’s rose from 1,225 tons in 1996 to 109,500 tons in 2013. More than eight cans in 10 come from China. Ghana imports 11 percent of all paste produced in China, and Nigeria takes in 14 percent, though these figures depend on the definition of tomato paste. Paste for export to Africa is a diluted, second-class product. At the 2016 SIAL international food exhibition in Paris, where the biggest Chinese canneries had a booth, I posed as a potential buyer to ask about prices and was shown a table of tariffs that varied according to the percentage of tomato. Though cans shipped to Africa usually have “double concentrate” on the label, they contain on average only 45 percent tomato with 55 percent additives and coloring. “Most of the product Chinese canneries export to Africa is diluted, though it’s not mentioned on the label,” said Armando Gandolfi of Gandolfi International Trading, the world’s largest tomato-paste broker, speaking from Parma. After independence in 1957, Ghana was a model of pan-Africanism and central economic planning. The country’s first president, Kwame Nkrumah, a socialist, invested in education, health, and infrastructure. His anti-imperialist industrialization policy aimed to curb imports. In the early 1960s, Ghana built two processing plants to avoid wasting surplus tomatoes, which otherwise rotted during the rainy season. But in February 1966, a military coup backed by the CIA overthrew Nkrumah, and the country remained politically unstable until 1979, when another military coup brought the neoliberal Jerry Rawlings to power. With the help of international financial institutions, he made Ghana a model of African neoliberalism. The two canneries closed in the late 1980s, after structural reforms advocated by the IMF. Most cans of paste on African markets bear little Italian flags, or the colors of the flag. The Gino brand, offering cans from 70 grams to 2.2 kilograms, has conquered Africa in a decade: Its mascot, Gino, is a cartoon tomato raising his sunglasses and smiling goofily. Gino products, distributed by the Indian multinational Watanmal, can also be found in Haiti, Japan, Jordan, New Zealand, and South Korea. The main competitor is the Tasty Tom brand, marketed by Singaporean group Olam International. Both firms have bought their product from canneries in Tianjin for many years. Jean-Baptiste MaletJean-Baptiste Malet is a journalist and the author of L’Empire de l’or rouge: Enquête mondiale sur la tomate d’industrie (The Red Gold Empire: a global study on the industrial tomato), Fayard, 2017.